The bestof Haverhill will hold its next monthly networking meeting on Thursday, May 15 at a new venue - a completely brand new one, in fact. Just a few days after the latest addition to Haverhill's eaterie scene, The Flying Shuttle,opens for business, thebest will be among its early users. The business group's networking event changes venue for this month from the Days Inn, with an invitation to find out more about one of The Flying Shuttle rotisserie and grill restaurant. Shona Mulvaney, the general manager of the new restaurant, will be showing local businesses around and explaining what The Flying Shuttle has to offer the business community. 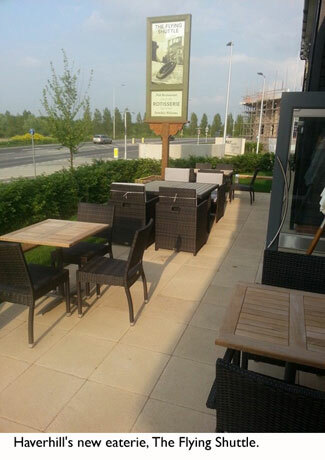 The new Marstons eaterie is at the entrance to Haverhill Research Park and is in a prime location for passing trade from the Cambridge to Bury St Edmunds road and the residential areas on the Cambridge side of town. Elaine Carr, owner of thebestof Haverhill, said: “It has been really exciting to see the development of the Haverhill Research Park over the six months. "I drive past nearly every day and it is always such a hive of activity. The Flying Shuttle seems to have gone up really quickly and I think it sets the scene for the research park as a place to work, rest and play. "Holding our monthly meeting there provides an opportunity for businesses to see the research park, the restaurant and the housing development and to get a feel for the type of environment that is being created. If you would like to attend this free event at The Days Inn Haverhill email Haverhill@thebestof.co.uk or call Elaine Carr on 01440 710 158 by Tuesday 13th May. 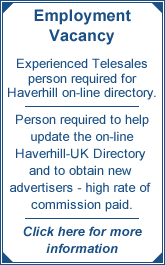 The monthly events run by bestof Haverhill are open to all local businesses and organisations.